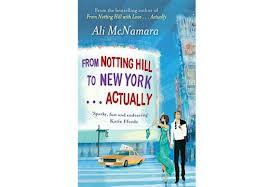 I have been sitting on the fence when it has come to Ali McNamara’s books. I remember reading From Notting Hill With Love….. Actually and I wasn’t over keen I found there was too many film references which to me felt like they took over the book but thinking back I think it could be because I am not a film buff a lot of the references were to films I had not read so in a way I didn’t understand the book. Then came Breakfast at Darcy’s which I loved and was one of my favourite books of 2011 so I was a little nervous about From Notting Hill to New York …. Actually. Scarlett O'Brien, utterly addicted to romantic films, has found her leading man. She's convinced Sean is Mr Right, but the day-to-day reality of a relationship isn't quite like the movies. With Sean constantly away on business, Scarlett and her new best friend Oscar decide to head to New York for the holiday of a lifetime. From one famous landmark to the next, Scarlett and Oscar make many new friends during their adventure - including sailors in town for Fleet Week, a famous film star, and Jamie & Max, a TV reporter and cameraman. Scarlett finds herself strangely drawn to Jamie, they appear to have much in common: a love of films and Jamie's search for a parent he never knew. But Scarlett has to ask herself why she is reacting like this to another man when she's so in love with Sean . . . I am not on the fence anymore! I am well and truly in Ali McNamara’s garden! I thoroughly enjoyed this book. I didn’t have a very open mind when I started the book so it had a lot of work to do to change my mind. What really had me hooked in this book was that there was no way of predicting the big twist that lay ahead in this book. It wasn’t until around page 323 that I started to get a little feeling I knew what was about to happen! This gave the book an exciting feel to it. The descriptive writing that is used around the hot spots of New York is fantastic it is quite clear that the author had taken out great first hand research and her experience is shown in the way she describes the places in the city, I actually feel as though I have seen a good part of New York! To go along with this fantastic storyline is a great cast of characters all who help to make this an easy 5 star read. Scarlett is a fun, energetic character whose life feels like a constant rollercoaster! Her friend Oscar brings a great deal of laughs to the book he is going to be a character you don’t forget in a hurry! My favourite part of the book is the treasure hunt I found myself trying to play along with the clues! I am so glad my partner brought this for me for Christmas it just goes to show that your opinion can change drastically from book to book. I would definitely recommend this book and I am looking forward to the next book by this author as I am sure there must be a follow on from this book. I will make sure I am front of the queue!